Fable adalah cerita narrative yang dilakoni oleh para binatang yang isi ceritanya mirip dengan cerita manusia. Lebih jelasnya langsung saja kita simak cerita di bawah ini. One day, a Lion lay asleep in the jungle. A tiny Mouse, running about in the grass and not noticing where he was going, ran over Lion’s head and down his nose. The unhappy Lion feared he could never escape, and he roared pitifully. His thunderous bellows echoed through the jungle. The tiny Mouse, scurrying about far away, heard Lion’s roars “That may be there very Lion who once freed me,” he said, remembering his promise. And he ran to whether he could help. Moral of the story: Even the strong sometimes need the friendship of the weak. Answer the questions based on the text above! Where was the story happen? When was the lion captured by some hunters? What was the moral value of the text above? The story was happened in the jungle. The lion, the mouse, and the hunters. The Lion was captured by some hunters when he was hunting for some food. The moral value of the text: Even the strong sometimes need the friendship of the weak. State true (T) or false (F) of the following statements based on the text! Arrange these words into a good sentence! Mouse Deer went to the edge of the forest. He loved the vegetables in Mr. Farmer’s garden. He lay on the ground and made his body stiff. He pulled Mouse Deer’s leg out of the snare. Mouse Deer landed with a soft plop. Once upon a time, there was a donkey in Guizhou. Someone officious shipped one there, but finding no use for it, he set it loose at the foot of the mountain. A tiger ran out from the mountains. When he saw this big tall thing, he thought it must be divine. He quickly hid himself in the forest and surveyed it from under cover, sometimes the tiger ventured a little nearer but still kept a respectful distance. One day the tiger came out again. Just then the donkey gave a loud bray, I thinking the donkey was going to eat him, the tiger hurriedly ran away. After a while, he sneaked back and watched the donkey carefully. He found that though it had a huge body it seemed to have no special ability. After a few days, the tiger gradually became accustomed to its braying and was no longer so afraid. Sometimes, he even came near and circled around the donkey. Later the tiger became bolder. Once, he walked in front of the donkey and purposely bumped it. This made the donkey so angry that it struck out his hind legs and kicked wildly. Seeing this the tiger was very gleeful, Such a big thing as you can do so little!’ With a roar, he pounced on the donkey and ate it up. Was there a donkey in Guizhou? When did the tiger hide himself in the forest and survey it from under cover? Why did the tiger hurry run away? Why did the donkey feel angry to the tiger? What did the donkey do then? When he saw a big tall thing, he thought it must be divine. Because thinking the donkey was going to eat him. Because the tiger walked in front of the donkey and purposely bumped it. He struck out his hind legs and kicked wildly. Once upon a time, there were three bears, a Papa Bear, a Mama Bear and a Baby Bear. One day, the three bears sat down to breakfast. “This porridge is too hot! said Papa Bear. This porridge is too hot!” said Mama Bear. “This porridge is too hot!” said Baby Bear. “Let’s go for a walk!” said Mama Bear. “When we come back, our porridge will be just right.” Along came Goldilocks. She walked into the houses. She saw three bowls of porridge. “This is too hot,” said Goldilocks. “This is too cold, “said Goldilocks. “This is just right!” said Goldilocks. And she ate all up. She ate the Baby Bear’s porridge. Then Goldilocks went into the living room. She saw three chairs. ‘This is too hard,” said Goldilocks. “This is too soft,” said Goldilocks. “This is just right!” said Goldilocks. Then CRASH, the chair broke. Goldilocks felt tired. She went into the bedroom. She saw three beds. “This bed is too hard,” said Goldilocks. “This bed is too soft,” said Goldilocks. “This bed is just right!” said Goldilocks. And she fell fast asleep. The three bears came home. They went into the kitchen. “Someone’s been eating my porridge,” said Papa Bear. “Someone’s been eating my porridge,” said Mama Bear. “Someone’s been eating my porridge,” said Baby Bear. “And they ate it all up!” The three bears went into the living room. “Someone’s been sitting in my chair!” said Papa Bear. “Someone’s been sitting in my chair!” said Mama Bear. “Someone’s been sitting in my chair!” said Baby Bear. “And now it’s broken! “The three bears went into the bedroom. “Someone’s been sleeping in my bed!” said Papa Bear. “Someone’s been sleeping in my bed!” said Mama Bear. “Someone’s been sleeping in my bed!” said Baby Bear. And here she is!” Goldilocks woke up. She saw three angry bears looking at her. Goldilocks jumped out of bed. She ran out of the house. And she never came back again. What is the title of the text above? How many bears are there? Mention it! Why did the three bears go for a walk? Who ate all up to the porridge? There are three bears. A Papa Bear, a Mama Bear and a Baby Bear. They had porridge for breakfast. The three bears went for a walk because their porridge is too hot. 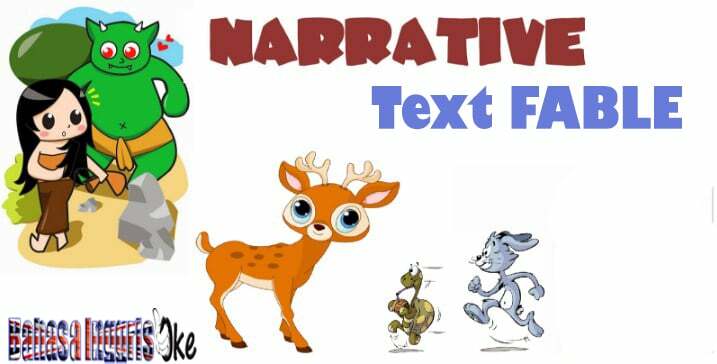 Semoga artikel ini membantu kalian untuk lebih memahami tentang Narrative Text khususnya Fable.